Read here about the wire spoked bicycle wheel, considered as a tensegrity structure. Not included here are various bicycles constructed as tensegrity stuctures; instead, see Bicycle. The discussion below is based on a presentation by Levin. The hub of a wire wheel is suspended in a tension network. The axle load is hung from the top of the rim that tries to belly out. Additional tension spokes are added horizontally to resist the bulge. For circumferential stability, the additional spokes are added. In a bicycle wheel, at any given moment the hub is suspended, hanging from the topmost spoke. Imagine if there was one wire spoke only. Its downward force would cause the thin, weak rim to buckle. What keeps the rim from buckling in a standard wheel? The other wire spokes constantly pulling in on the rim circumference--they keep it round. All the spokes are under constant and equal tension. The tensions are preset and do not vary with the load. It is an integrated structure with each spoke depending on every other to share the load at all times. The compression of the ground to the rim is distributed through the tension spokes to the hub. Therefore, there is no direct compression link between the load on the bicycle frame and the ground reaction force. The bicycle is suspended off the ground in a tension spoke network, hanging like a hammock, and the same system works equally well in a unicycle as a bicycle or tricycle. In a cycle wheel, the hub and rim are compression elements kept apart by tension spokes. There are no bending moments in the tension spokes, which are pre stressed, under constant tension. The cycle wheel exists only as an integrated structure. One spoke will not hold up under the weight of the load. Once constructed this way the tension elements remain in tension and compression elements remain under compression no matter the direction of force or point of application of the load. It makes no difference where you compress the rim of the cycle wheel; the load is equally distributed through the spokes to the hub. The rim of the bicycle is a geodesic, connecting the many points of the spoke attachments, the more spokes the rounder it gets. 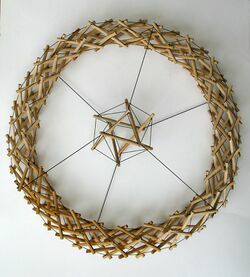 Tensegrity model of Bicycle Wheel, icosahedron in a torus, by Flemons, based on Levin's concept. Wagon wheels vault from spoke to spoke. A wagon wheel transmits the wagonload to the ground through the axial compressing the spoke between it and the ground. Compression in a column creates shear stress. Therefore, the column must be thick, stiff and strong. The spoke has to be strong enough to withstand the full weight of the wagon; it gets no help from the other spokes, which, at that moment, sustain no load. Besides the compressive loads, internal shear is created within the spoke. When loaded each spoke acts as a column with compression and shear. Levin responds: All tensegrities have part of their compression on the outer shell of the construct. They may be the tips of the rods, the nodal points, but they are there. If you put those tips close enough together, it will look solid, but function as a tensegrity. In a BW it is clear that the hub is a compression in a network of tension, a 'floating compression', and it is clear that it is a closed structural system whose compression struts do not touch each other, forming a firm, prestressed, tension and compression unit. It is my belief that the force vectors are triangulated.